This is a special post by our guest travel contributor Kristin Campbell. For so many people around the world, travel is somewhat of a pipe dream or simply not an option due to circumstances, time constraints, work, the list could go on and on. With that said, let me start by saying that there are simply not enough words to express my gratitude for the life experiences and adventures I’ve had since my early 20’s. Everything from my usual business travels, to a weekend road trip to the nearest body of water and sunshine, or the other end of the spectrum with some of my last minute ‘fly by the seat of your pants’ globetrotting to some corner of the world. I am always in for a good adventure, and continue to be plagued by something a friend of mine refers to as the F.O.M.S., or fear of missing something, which is why you’ll never catch me sitting still for too long. My most recent adventure was a long time in the works with an amazing group of friends, and had been on my bucket list for over a decade. You know, one of those places you’ll get to, maybe, someday. 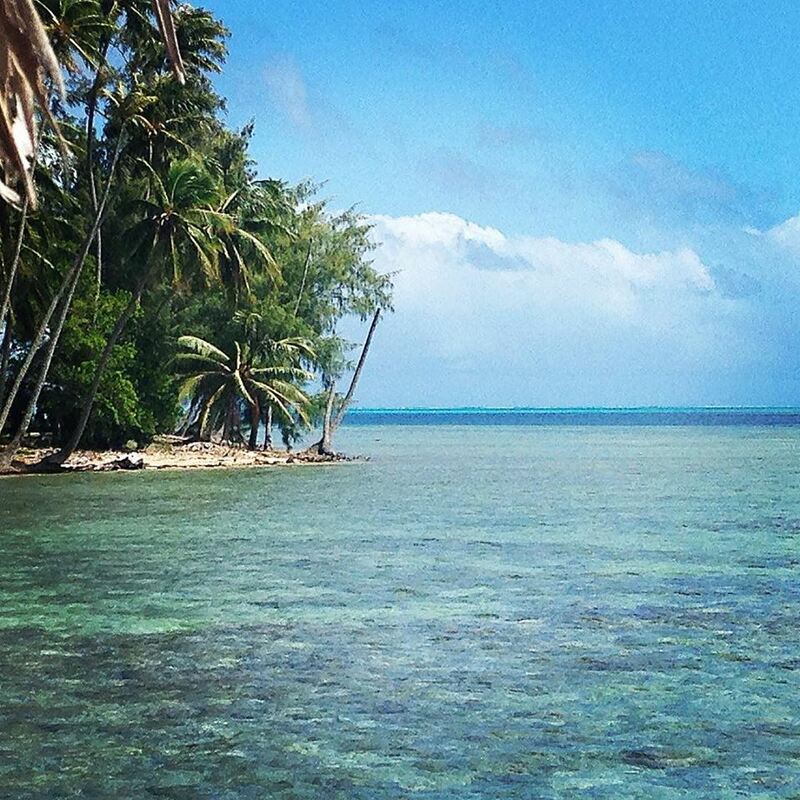 Well, after a year and a half of planning, we finally got there, to Tahiti, French Polynesia. A beautiful chain of islands in the south pacific, and now also one of my new favorite places. 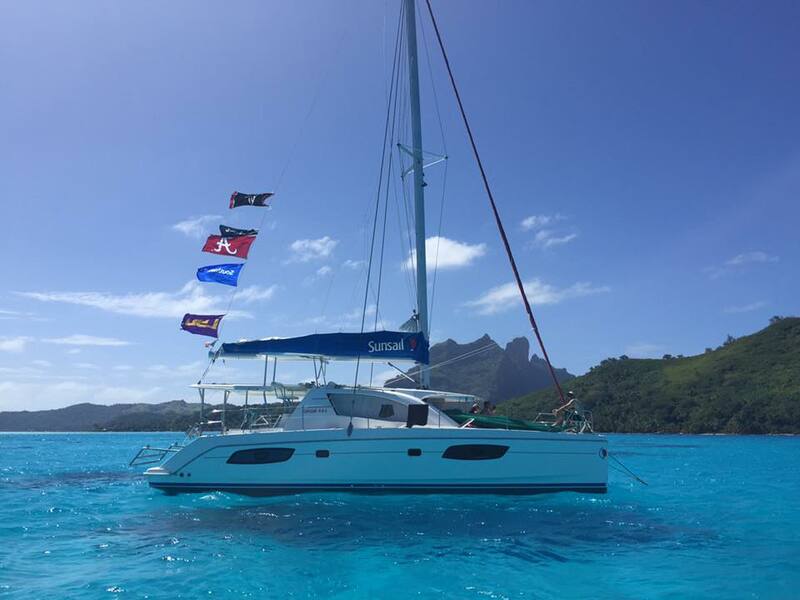 Our group was fortunate enough to have had 12 days to go exploring, the first three days on the main island of Tahiti and from there left to spend the remaining nine days sailing between the Leeward Islands which include Raiatea, Taha’a, Bora Bora, and Huahine. Tahiti is most easily accessed via the island’s major airport in Pape’ete. Coming from Los Angeles (LAX) it’s an 8 and ½ hour trip, which was actually very enjoyable thanks to Air Tahiti Nui and their great in-flight service. Upon arrival, we were greeted by a friendly local Polynesian band their traditional island music, prior to clearing customs. From the airport in Pape’ete (PPT) we then made our way to the Tahiti Pearl Beach Resort at Lafayette Beach, via a 20 minute taxi ride. The resort, formerly owned by Radisson, is located on the northeast side of the island and fairly secluded, but also offers easy access to downtown Pape’ete. After the long trip from Atlanta, it was an awesome place to unwind. The hotel rooms offer nice views of the island of Moorea and Matavai Bay, and easy access to the beach, as well as their beachfront infinity pool, and waterfront restaurant. 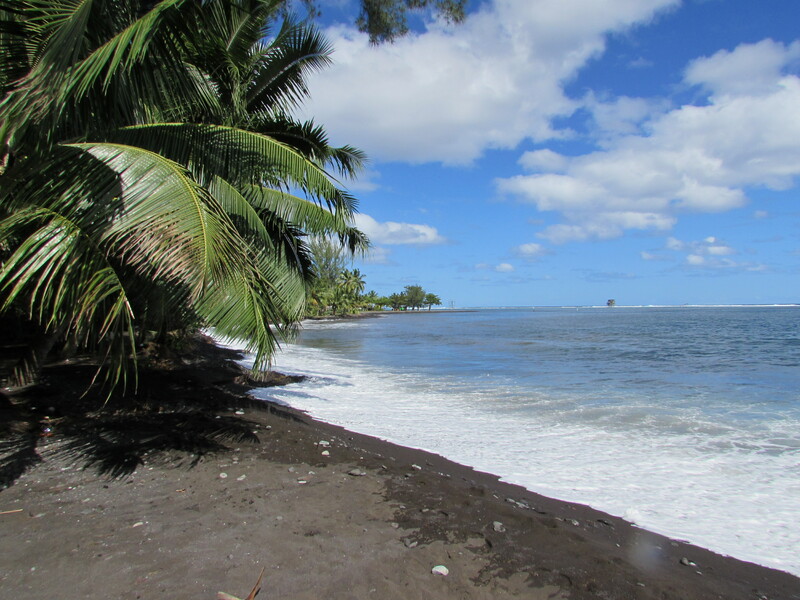 On Tahiti, there is plenty to do, or just relax if you prefer. In our short time there we did the best of both. Day one we were all a little jet lagged and enjoyed relaxing at the infinity pool and beach, and of course got a good workout in at the hotel fitness center (anyone who knows me knows I never leave home without my running shoes!). 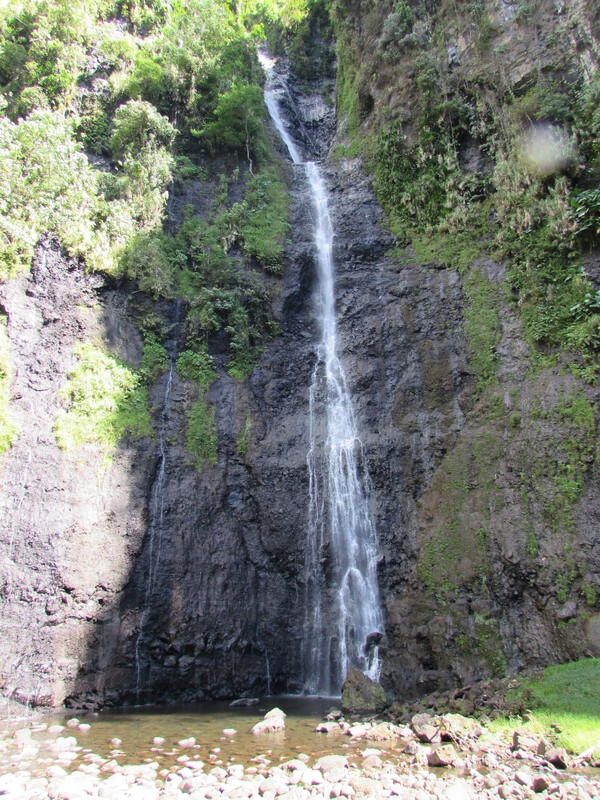 The second day we rented a car to go cruising around to some of the main points of interest which included the beach and lighthouse at Pointe Venus, the famous surf beach at Teahupoo, as well as a gorgeous 5 mile hike at the Trios Cascades (translated The Three Waterfalls). We ended the day with a sunset happy hour on the water at the Pink Coconut, followed by a nice seafood dinner at La Casa Bianca which is a local favorite. From there, on our third full day began our island hopping. Starting with a 45 minute regional flight on Air Tahiti Nui from Pape’ete to the island of Raiatea where we chartered a catamaran from Sunsail. For those familiar with sailing, we did a bareboat charter and did the sailing ourselves, thanks to two of my best friends who have their licenses. Our boat, Tatia III, was a Sunsail 444 – a 43 foot, 4 cabin catamaran. I’ve also added getting one of those to my maybe, someday, list of things to do! The marina was nicely kept, and the Sunsail staff was very helpful. We were able to enjoy a traditional Polynesian lunch after the boat and safety briefing, and then set sail. 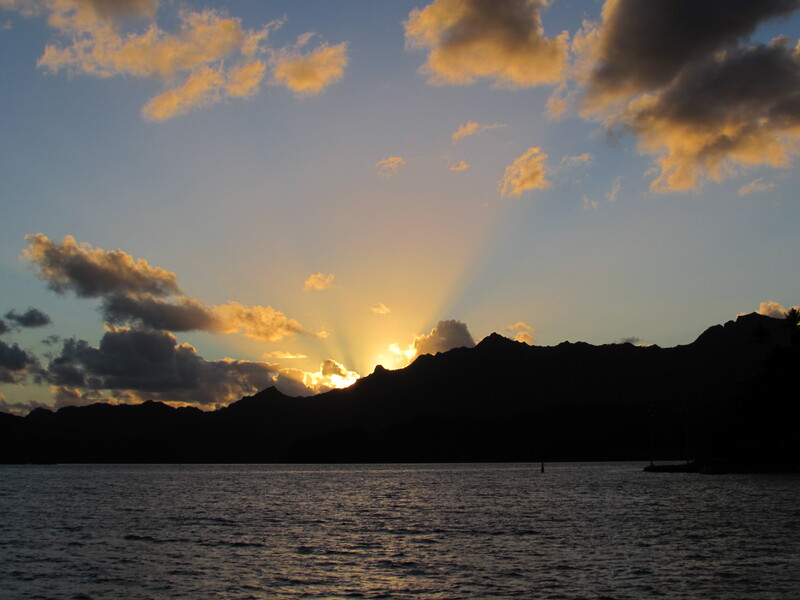 Our next sail was over to the island of Moorea. Our highlight there was Stingray Island. By island, I mean it’s actually a tiny sandbar in the middle of the ocean where the stingrays congregate and you and swim with them in the wild. They are very tame there being used to all of the tourists coming to feed them daily, so they won’t hesitate to swim right up to you and say hello. Along with the stingrays, we also saw the black tip reef sharks as well. I highly recommend checking this out if you’re ever in Moorea. Crystal clear blue ocean (pictures hardly do it justice), and swimming with some amazing animals in their natural environment. 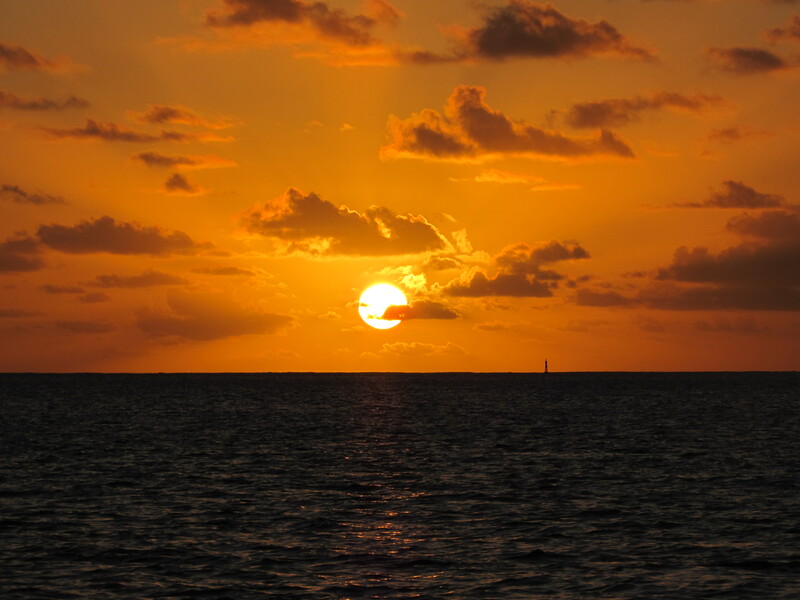 After our visit with the stingrays, we continued on with five hour sail to the next stop. I knew it was probably going to take a lot to top Moorea, but we definitely saved the best for last. Where you ask? 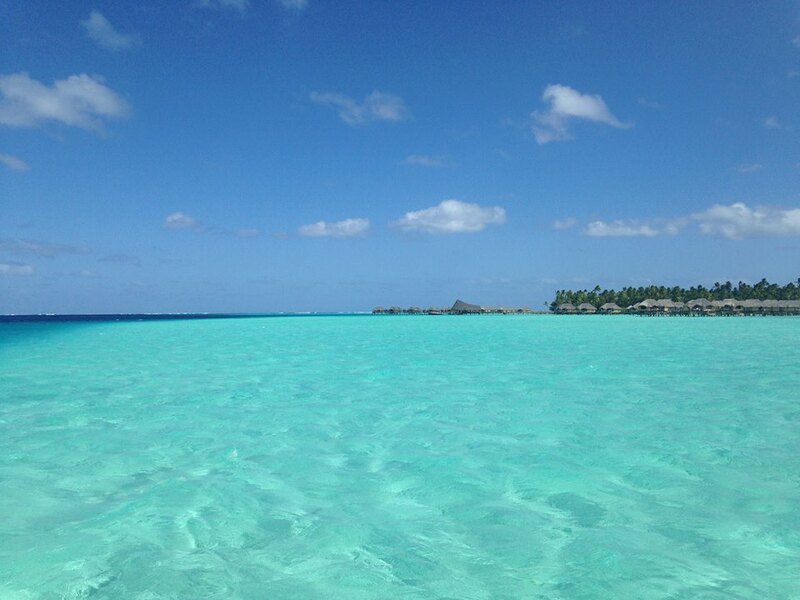 Bora Bora. 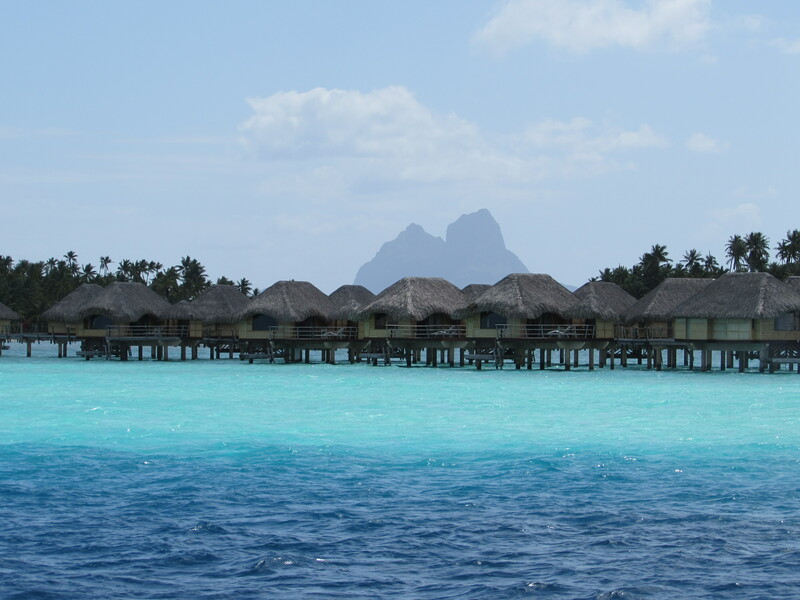 You know, that island that’s always in the magazines with the overwater huts as hotel rooms, blue skies, and killer sunsets. It was everything I expected and so much more, I wish we could have stayed forever, but we fit a lot into our four days there. When we arrived, we were greeted by a large pod of bottle nose dolphins that were playing and swimming with our boat for quite a while, almost magical, like they came to welcome us. Our first stop on Bora Bora was the world famous, Bloody Mary’s, restaurant, bar and yacht club. For boaters, it’s a great place to get fuel and water and anchor for the night. Their happy hour and dinner were amazing, rave reviews from our whole group! Great island drinks, and the dinner menu was inclusive of everything that was caught earlier that day. Tuna, sword fish, salmon, sea bass, you name it, they had it all, along with good service and wi-fi. Our second day brought some of the best scuba diving I’ve done so far! We coordinated a rendezvous dive with Top Dive http://www.topdive.com/bora-bora-diving.htm , so they picked us up at our boat first thing in the morning to head out. Two dives, both sites were incredible. The first was at Tapu, which is a coral drop off where we saw lemon sharks, black tip sharks, turtles, and moray eels. 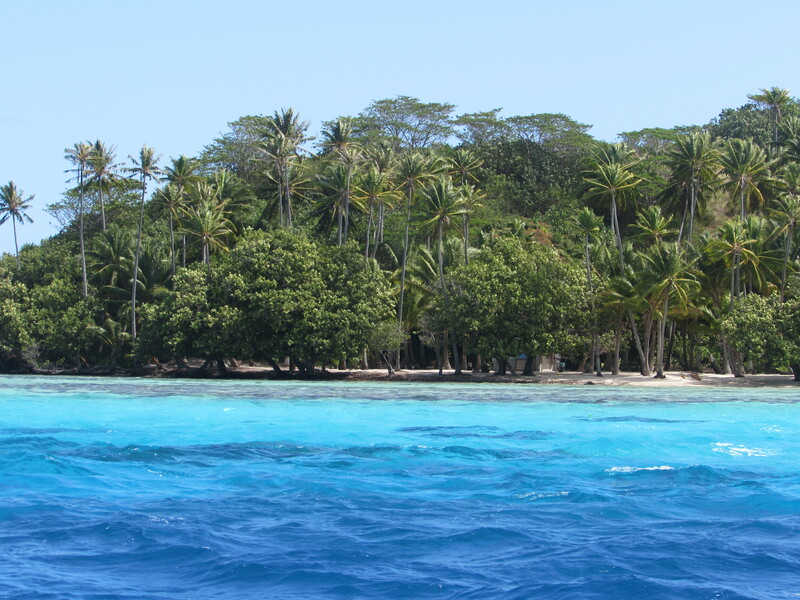 The second dive site at Haapiti was more of the same wildlife, some shallow craters and reef canyons. Both dives were between 50’-80 feet and 100+ feet of visibility, it doesn’t get much better than that. The dive masters were very friendly, and extremely knowledgeable about the dive sites and all of the wildlife as well. 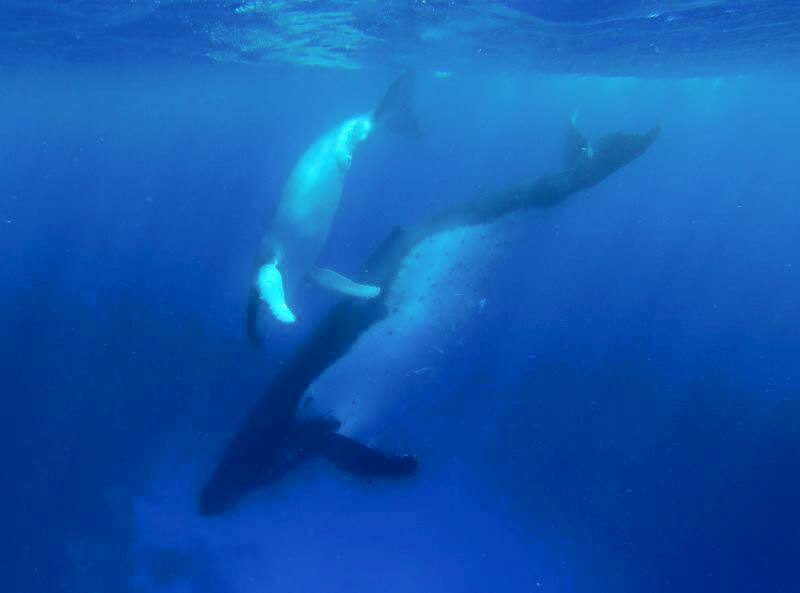 At the conclusion of our dive, they also suggested that we should consider going on a whale watching tour the next day, as the humpbacks migrate to Bora Bora this time of year. Per their suggestion, we made reservations for the next morning. 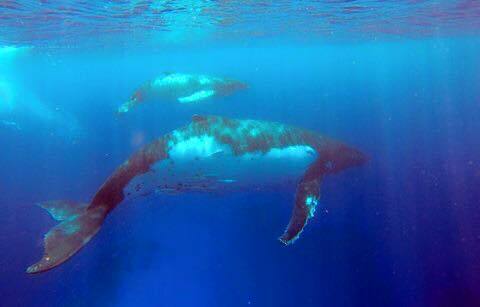 To date, this whale watching tour is without a doubt one of most amazing things I’ve experienced in life. To start the day, the owner of Tohora Bora Bora (http://www.tohoraborabora.com/ ), Simon Cencier, came to pick us up on his boat and we headed out from there. I wasn’t quite sure what to make of it at first, just cruising around in the ocean looking for whales, but this tour far exceeded any of my expectations. Simon was prepared with state of the art equipment and a plethora of knowledge, and was determined to show us a good time. About 30 minutes into the tour we spotted some of the humpbacks off the shoreline, so unlike what I was thinking initially, we actually got in the water and swam with them. They’re very mellow animals, not phased at all by our presence. It was a little intimidating at first because they are huge, between 40-50 feet long (comparatively about 8 feet larger than the boat we were sailing), but so incredible. They swam within a few feet of us, and were singing underwater which sounds a bit like a cross between Swahili and Chewbacca. It was one of those once in a life time experiences that I’ll never forget, and by far the highlight of our vacation and a great adventure for the last day. 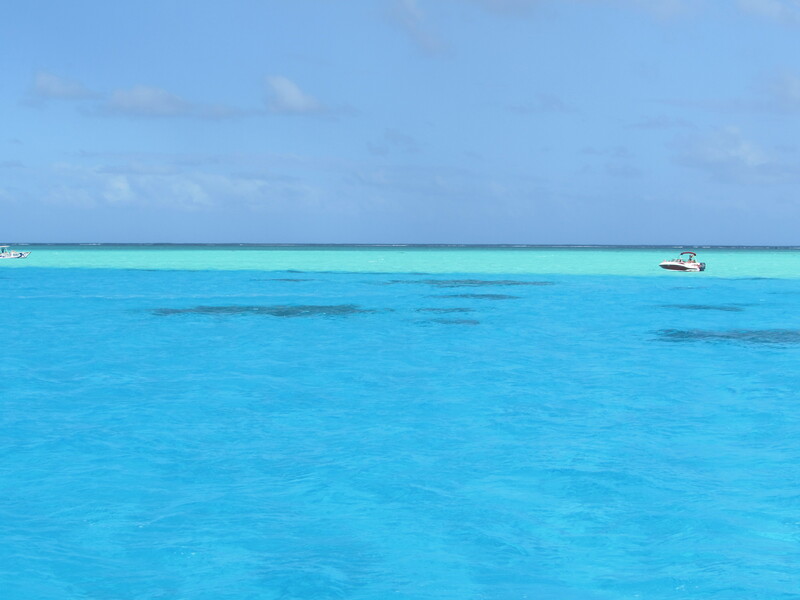 This article and pictures hardly do it all justice, if you’re looking for paradise you’ll definitely find it in Tahiti. Until the next adventure, don’t dream your life, live your dream. I am a really happy, free-spirited, energetic, go getter, nickname, Sunshine. I think every day is a gift, and it’s my goal to live every day to the fullest. I am almost always in a good mood, and like to laugh a lot and have fun! So SMILE 🙂 I don’t like to miss out on anything that life has to offer, have a love for globetrotting and finding the next adventure, wherever it may be. 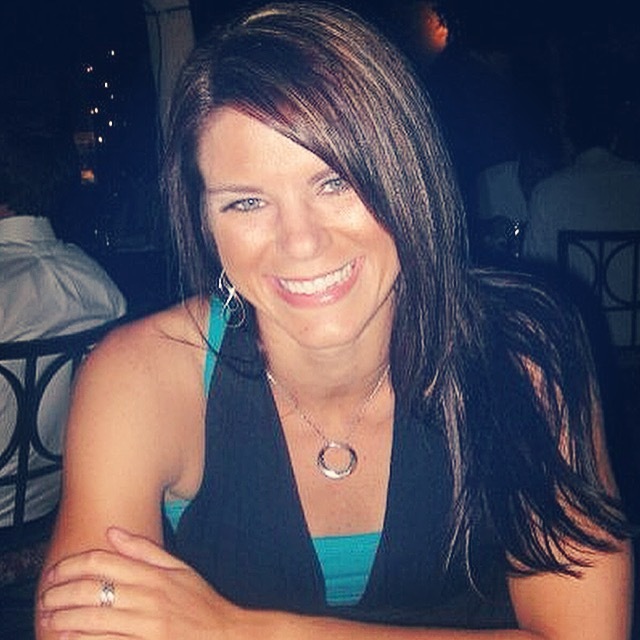 Sales trainer by day, fitness, running, yoga, travel junkie in my free time.